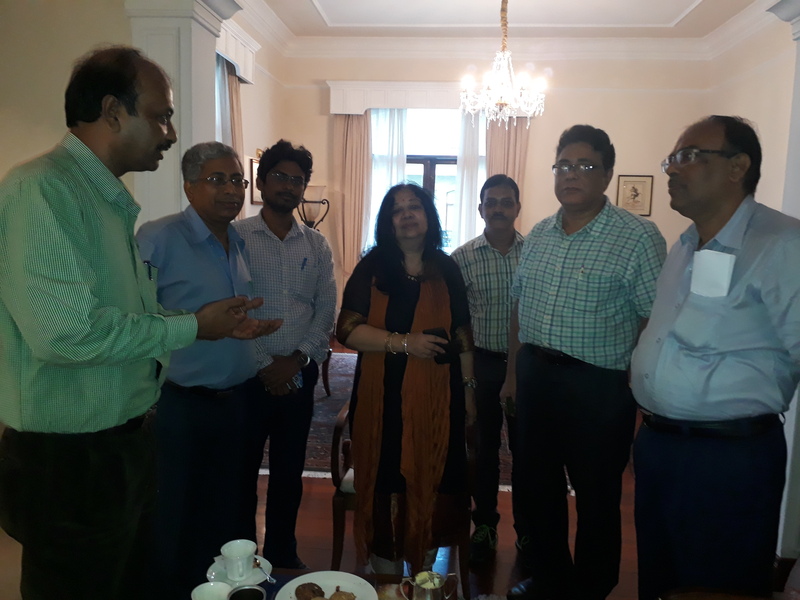 Com Dilip Saha CS, Com Sankar Sanyal President, Com Soumen Ghosh ACS, Com HareKrishna Fouzdar and Com Tapas Ghosh CS/SNEA/WB met Smt Sujatha T Ray, Dir HR at Oberoi Grand to get the latest status on some long pending pressing issues. Shri K C Ghosh PGM/NWO/CFA was also present in the meeting. Com Dilip Saha enquired on E2/E3 pay scales for JTO/JAO and SDE/AO respectively- Dir/HR informed of DOT’s wrong interpretation on payscales awarded to JTO/JAO and SDE/AO during formation of BSNL. It held it as a one time dispensation for BSNL absorbees and that the BSNL recruitees are entitled to E1 payscales which is uttrly incorrect. CMD instructed to take up the issue with DOT once again and accordingly Dir/HR will send a clarification to DOT in this regard soon. However, she suggested association take up the issue with the highest authority of DOT. She felt, taking up the issue with Secretary DOT would be a better option. On 3rd PRC–she said hon’ble minister was keen to see 3rd PRC comes up but over the last few months there is no initiation visible in this regard. The financial position of BSNL is plummeting over the days endangering the prospect of 3rd PRC. However, it is to be noted that govt has provided clearance to proceed on Wage Negotiation Committee but then the case in respect of executives is yet to get a clear signal. She also said that there is some activities palpable in preparing cabinet memo but nothing can be assured at this stage. Association informed of trade union program notified by SNEA to demand E2/E3 IDA payscales and 3rd PRC besides others. CPSE Hierarchy-She said the draft is awaiting report of the committee meant to address on reservation. The matter needs to be examined to insulate it from legal implications in future. Management is contemplating for DPC to the extent feasible in various cadres and thereafter undertake the notification. Group Term Insurance--Association insisted to finalize the policy without further delay. Dir/HR informed to be nearing completion the negotiations with the concerned agency. She hopes to complete the exercise soon. Submission of delegate list by respective Zones to CS by 15th of Sept 2018 meant for AIC to he held on 28/11/2018 to 30/11/2018 at Ludhiana, Punjab. As per the decision of the meeting held on 06/09/2018 at Telephone Bhavan , all Zonal Secretaries are to hold General Body meeting for electing delegates to attend AIC/Ludhiana. The list of delegates so elected should be submitted to CS/SNEA/CTC duly signed by respective Zonal Secretaries by 15th of Sept 2018. This information hosted on website is in continuance of intimation conveyed over phone, WhatsApp and through sms to Zonal Secretaries by Circle Body. RELAY HUNGER FAST at BSNLCO by CHQ Office Bearers, CSs, CPs etc from 24th September, 2018 onwards: All the CHQ OBs, CSs and CPs of all the Circles and other activists joining the RELAY HUNGER FAST is to reach Delhi by 23rd evening or 24the early morning. The RELAY HUNGER FAST will start exactly at 10.00 AM on 24.09.2018. Return journey can be decided later. Circle Conference of SNEA/Calcutta Telephones was held on 31/08/2018 and 01/09/2018 at SBIOA House, Bentinck street, Kolkata-69. The delegate session started with hoisting of flag amid chanting of slogans of SNEA Zindabad! BSNL Zindabad! The house then observed silence in memory of our departed comrades. After the welcome speech by the President of the house, the delegates were introduced to each other through self introduction. Circle Secretary placed an extensive report covering all activities and developments that had taken place during his tenure. The report was considered by the house and adopted. This was followed with adoption of Treasurer’s report after its due scrutiny by the august house. The house welcomed Com A A Khan President/SNEA, Com K Sebastin, GS/SNEA and Com Padmanavan Rao, AGS/SNEA amid slogans and standing ovation. All the CHQ office bearers addressed the house touching upon the burning issues pertaining to E2/E3 IDA payscales for JTO/JAO and SDE/AO and other equivalent cadres, pending promotion, the status on CPSE Hierarchy notification, 3rd PRC, Group Term Insurance, loss to post 2007 JTO recruitees, etc. Given the time constraint, house adjourned for the day and all delegates proceeded for Joint Open Session scheduled to commence from 4 pm at Moulali Yuva Kendra. On second day, the delegate session started with discussion on organisational matter followed with service related issues. The executives working under CFA are loaded with multifarious work and are overly stressed. There was suggestion to transfer the work for ICB to accounts. The house emphasized to take special drive on FTTH connections and EB and called upon to build optical fibre network backbone. The house endorsed the developmental activities taken up by Calcutta Telephones but called for restraint on excessive pressure and intimidation. It expressed serious reservation among executives on delay in processing of medical and other bills, mainly in planning section. Almost all matters in planning section are alleged to be kept pending without any tenable reason. It took note of small issues like payment of TA/DA bills to newly promoted JTO getting curtailed on untenable ground and on recording of academic qualification achieved while in service. It took stock of the dearth in staff to maintain services and called for intervention with appropriate authority to ease building infrastructure. The delegates unanimously called for immediate settlement of E2/E3 IDA payscales, notification for CPSE Hierarchy, implementation of 3rd PRC, 30% superannuation benefit, resolving pay disparity for post 2007 JTO recruitees, E1+5 increments for 2010 onwards JTO/JAOs, Group Term Insurance, etc. The house held serious views on the above issues and delegates belonging to new generation held the isuue of E2/E3 IDA payscales as one of the main cause for discontent among new generation. In the second phase of address by Com K Sebastin, GS and Com A A Khan, President, the issues were elaborately explained and latest status in respect of each item was conveyed to the house. The history of E2/E3 IDA payscales was brought forth and explained on how some forces are putting weird demand of cascading and retrospective effect (from 01/10/2000) to derail the issue. The executives may be miffed at SNEA for the delay but there is no reason to shift allegiance when other stands nowhere close to meet skyhigh but impracticable demand framed on popularity plank. GS conveyed how at the intervention of SNEA, BSNL took initiative to take up the issue with DPE and how the same is gaining momentum in positive direction. DOT reportedly held discussion on 3rd PRC and conveyed instructions to prepare for its note for further processing. But the process to overcome cabinet approval will not be that easy. SBI Life is in its final stage to confirm on quotes and the matter is in its final stage. All employees upto 50 years are to get coverage of Rs 50 lacs. GS explained the demand for 3rd PRC and that for E2/E3 payscales need not be equated. 3rd PRC will benefit all. BR rcruitees will be credited with contribution on enhanced pay scale towards EPF and Pension Fund. The demand is a common one among both executives and non executives whereas E2/E3 is an exclusive kind of demand for executives. Non executives do have their respective demands and any attempt to include all will disturb the structured approach. GS intimated on Apex court’s rejection of SLP filed by BSNL for pay fixation of JTOs officiating under FR 22 1 (a) 1 with FR 35 restriction. This paved the way for generalisation of the order. Com A A Khan, President made an inspiriting deliberation and urged upon new generation to take up the reins. He categorically believes that if SNEA fails then there cannot remain any other association to achieve it. Its SNEA that holds credibility of such struggle and is confident to achieve it. He believes, the young executives in SNEA have the prowess to bring the confused and directionless executives into our fold. Following the deliberation by CHQ office bearers the exercise for formation of next body started. JOINT OPEN SESSION on 31/08/2018 at Moulali Yuva Kendra—It was A joint open session of SNEA/ Calcutta Telephones Circle and SNEA/WB Circle. The house was packed with audience and the stage with galaxy of very senior officers from Circles and Regions. The session started by paying homage to our great leader Lt Com Sesagiri Rao who served at various level in SNEA and was the doyen of SNEA. Shri S P Tripathy CGM/CTD, Shri S K Garg CGM/WBTC, Shri Gautam Guha, CGM/ETR, Shri A Majhi CGM/ETP, Shri A K Kundu, CGM/Telecom Factory, Mr S Kujur GM/Finance/CTD, Shri P K Mahapatra GM/HR &Admin/CTD, Shri K C Ghosh PGM/NWO/CFA, Shri Pradip Gupta, GM/Tx, Shri Achintya Biswas GM/BA/East, Smt A Das GM/HR/WBTC, Shri Hari GM/HR/ETR, Shri A N Thakur GM/HR/CTD, Com A A Khan President/SNEA, Com K Sebastin GS/SNEA, Com Padmanabhan AGS/SNEA and Com Soumya Dutta GS/AIBOC graced the occasion and addressed the august house. The rich and informative deliberations by various dignitaries held the audience captive for more than four hours. Following welcoming of the dignitaries by presenting flower bouquet, Com Dilip Saha, Circle Secretary/SNEA/CTC read out the keynote address to the house. Shri S P Tripathy lauded the keynote address for including all important items pertaining to CTD. He emphasized on his effort to connect customers and maintain reliable service. He spoke of his approach that devotes the initial months to develop a system and thereafter the system is allowed to work on its own. He is of the view to utilize the resources available with us instead of crying what is not there. He sees lot of prospect in FTTH and EB and that he always felt to drive the officers to deliver. He is of the view that if BSNL fails to deliver then the other operators are not going to wait. He stated to have no grouse against any staff but in order to draw work, it is necessary to keep watch over the progress. Shri S K Garg, having joined as CGM/WBTC spoke on the models adopted by Shri Tripathy. He spoke on drawing opinions and suggestions from associations and look forward to their support. He wish harmony exists in all unions and associations. Shri Gautam Guha CGM/ETR drew attention to commissioning of Trans equipment, viz OTN, OCLAN, CPAN etc on major routes. He informed of restoring link from Kolkata to Kharagpur and extending OTN connection to Uluberia. All efforts had been taken to stabilise the service such that services enjoyed by the customers stay uninterrupted. He lauded the keynote address of the circle secretaries and hope to continue with its target in future too. Shri A Majhi CGM/ETP considers OFC as most harmless object thus dealt without care by other agencies unlike power cable or gas pipeline. He spoke on the constraint in laying cables and apprised on future projects in pipeline. Shri A K Kundu CGM/Telecom factory deliberated on productions in factory of various items. Both GM/HR thanked the association for taking up issues with cause and proper justification. Shri K C Ghosh PGM/NWO/CFA/CTD spoke of support from executives and how CTD strived to achieve targets in EB. He also spoke of serious endeavour in extending FTTH connections and sealing agreement with Cable TV operator for its expansion. He appreciated the positive outlook and steps taken by CGM in this regard. Shri S Kujur GM/Finance spoke of his association with CS/CTD and Finance had taken effort on project Aiswariya and Samundra Manthan. The effort put on to hold Lokadalat turned effective in retaining customers. Shri Pradip Gupta PGM/Tx addressed on pl;ans of transmission wing and the hurdles being faced in the face of damage by other agencies. He also spoke on plans for CPAN and VMUx installations. Com A A Khan President –spoke on govt’s apathetic attitude towards BSNL. He cited govt’s dillydally on allotting 4G spectrum and not complying to tender agreements in respect to supply of equipments. He was all praise over Calcutta Telephones given its emergence as a new force in Eastern region. Com K Sebastin GS/SNEA appreciated the performance of Calcutta Telephones. He highlighted the progress with respect to other circles in Eastern region. A general observation had grown over CTD and WBTC for delivering upto the mark. The service parameters and performance as a whole was in poor shape. However, over the last few years, CTD made a mark. GS expressed his gladness to see CGM/CTD acting like a professional business man. It is time to abandon old ideas and look forward to services extended in terms of business. He wished CTD all success. Com Sankar Sanyal Jt Secretary(E) thanked all dignitaries and wished the best for CTD. Com Padmanabhan Rao AGS extended the vote of thanks and called for implementation of 3rd PRC. The officers in the auditorium who graced the occasion are Shri Srikant Pal GM/Tx/CTD, Com S K Deb GM/Cal SSA and Shri P K Sahana GM/ETR. Shri Deb briefed the house on WBTC’s effort to forge agreement with cable operators to extend FTTH connections. The following Office Bearers were elected unanimously for the next term.